A Huntingburg woman already jailed on charges of drug possession and identity deception now faces more than 30 felony counts after an ongoing police investigation that was launched after her initial arrest at a Jasper hotel more than a week ago. Last Monday January 28th officers with the Jasper Police Department and deputies with the Dubois County Sheriff’s Department responded to the report of possible drug activity at the Super 8 Motel that would eventually lead to the arrest of 34-year old Tawna Knebel of Huntingburg after both departments recieved a tip about drug activity occurring at a room at the motel. The Jasper department’s K-9 unit Ares was brought to the scene and conducted a free air sniff of the 1st floor hallway. Police say Ares indicated the odor of narcotics coming from Room 100, a room occupied by Knebel who, after speaking with officers, provided them with a small baggie containing a small amount of suspected Methamphetamines in which she had in her possession. A search warrant was granted that allowed officers to search the rest of the hotel room. were found and believed to have been stolen by Knebel. Also found was an identification containing the stolen information but with Knebel’s photograph. Knebel admitted to fraudulently using the identifiers of another person to obtain an ID. 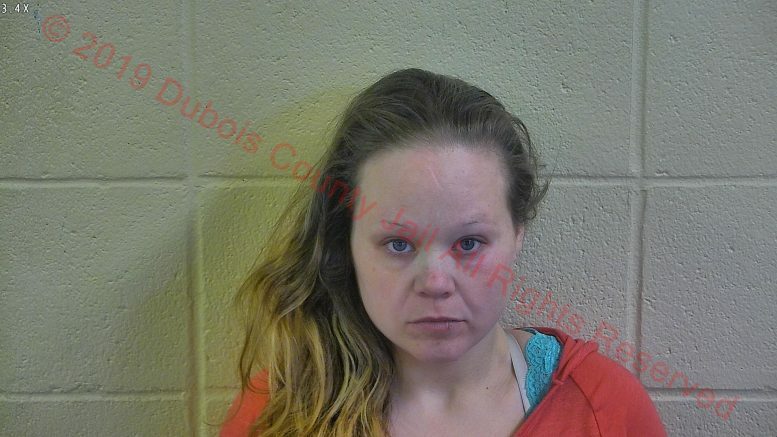 Knebel was placed under arrest and was taken to and booked into the Dubois County Security Center for Possession of Methamphetamines and Identity Deception. Police said at the time of Knebel’s origional arrest last week that their investigation was ongoing with the possibility of additional charges. And that they would provide more details as soon as they become available. That investigation has now lead to a total of 32 Level 6 felony counts against Knebel including 1 count of possession of methamphetamine, three counts of identity deception, three counts of synthetic identity deception, 13 counts of counterfeiting and 12 counts of forgery. Police say their investigation is ongoing and that additional charges are likely against Knebel once all victims have been contacted and evidence can be processed. Knebel remains lodged in the Dubois County Security Center. Be the first to comment on "Huntingburg Woman Facing More Than 30 Additional Charges After Investigation"